Our Nature Explore classroom has become a special refuge for learning, sharing and making discoveries. The outdoor area is divided into several areas, each featuring a variety of nature-inspired spaces and materials. 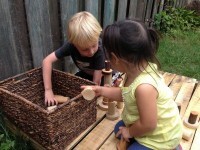 The messy materials area gives the children a place to explore dirt, water, rocks, mud, and hay. 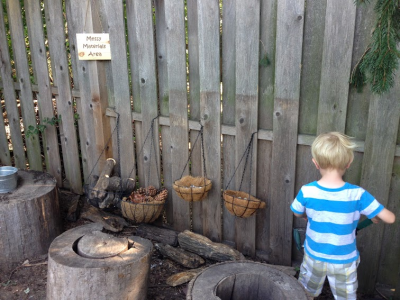 The space is inhabited by a small forest of tree stumps and logs that are transformed during imaginative play, from kitchens and castles to kingdoms and concoctions. The garden area is another space that affords ample opportunities to educate and inform. 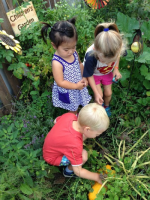 As the children tend the plants they learn about the science of life. The physical aspects of gardening also offer the children a plethora of sensory experiences. They smell lavender and mint, feel the soft, fuzzy leaves of lamb’s ear and develop motor skills by digging and navigating the paths. 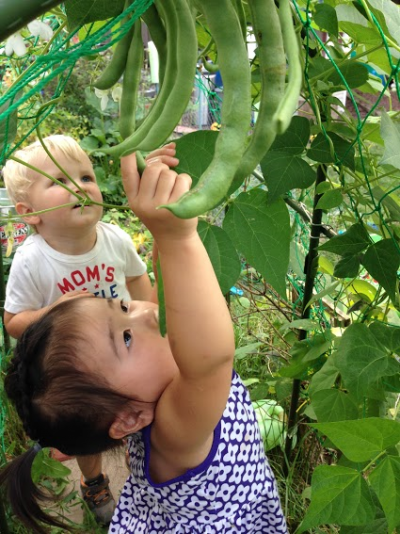 Nearby, the garden and messy materials area have a pea tunnel, which is a favorite among the kids for the sanctuary it provides as well as the green beans they can pick to bring home to their parents for dinner. Adjacent to the messy materials area is the sand and water tables, which are fertile grounds for experiments and excavations with buckets, shovels and trucks. Cooperative play often emerges of its own accord as the children discover how heavy buckets full of sand and water creations can be for just one child to carry. The music area is home to many instruments of natural and organic construction, such as bamboo wind chimes, wooden rhythm sticks and drums. The children love investigating the range of sounds they can create with the chimes and all the different ways they can influence their music. Near the music area is the combination stage and block area. A wooden pallet serves as an elevated platform, perfect for performances and dramatic play. 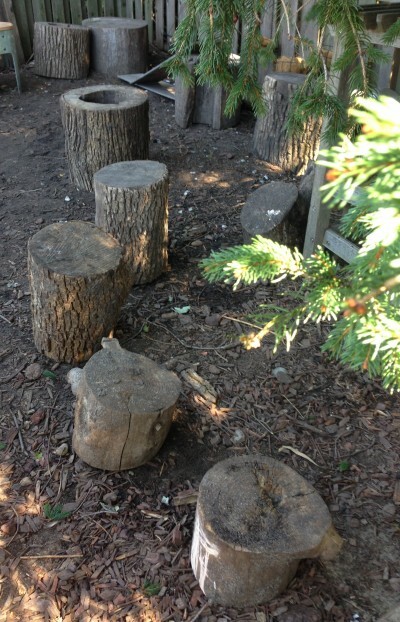 It also serves as a level surface for block building and construction with tree cookies. Our gathering area has a bubbling water fountain that is set within a small perennial flower garden. This space is furnished with a birdbath, designed and made by the children, a squirrel feeder, made by loving grandparents, and two child-sized garden benches facing each other. The children gather here to listen to the bubbling water and observe the wildlife. The space also gives children a place to come to calm and collect themselves. As a Kohl McCormick Award-winning program we seek to continue providing an optimum learning environment that is best for our children. 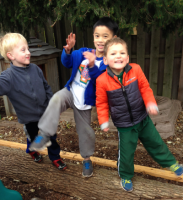 We knew the Nature Explore Classroom would provide the best learning for our students. 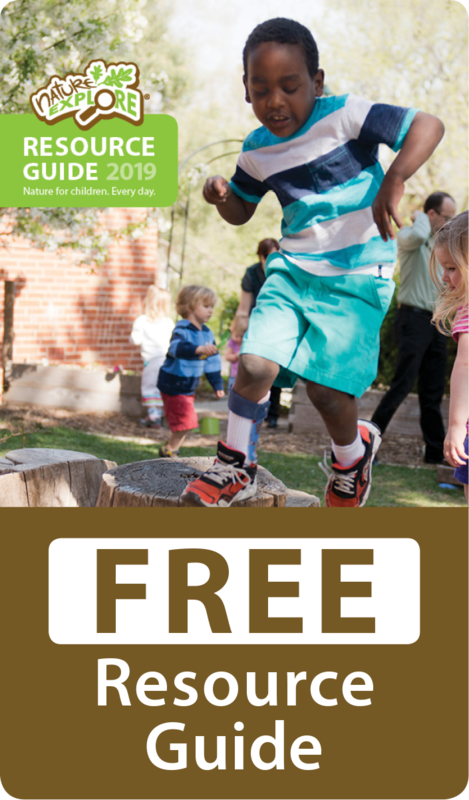 As we worked and completed several nature center areas throughout the spring and summer, we instantly saw that the children were engaged and learning in new ways. 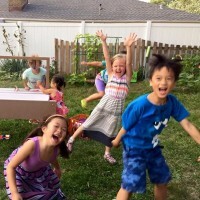 They took more time to explore, more time to cooperate with each other in tasks, played more running games and engaged in more creative, dramatic, and imaginary play. The re-designed outdoor play areas have had a profound effect on the children, parents, siblings, staff and our community.